Rosacea/Erythema, is nothing dangerous but it seems like you're constantly warm or constantly blushing. There may also be visible small veins. The disorder involves the increase in the with off the capillaries. In rosacea the capillaries are continuously dilated so the skin is continuous reddish. Unfortunately, this condition does not heal, but it doesn’t mean that we cannot do anything about it. 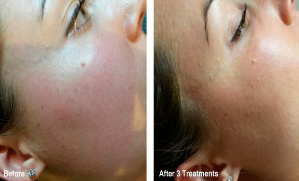 One of the ways to treat rosacea/Erythema is through IPL. IPL works with light, which affects the hemoglobin in the blood vessels. Hemoglobin is the red color in our blood. With the IPL treatment the blood vessels are heated so that they coagulate. It may take several sessions before there is a clear visible result. On average 5 treatments are neaded to achieve a good result. The result may depend on the skin color and the thickness of the capillaries. The treatment can sometimes be a bit sensitive, a feeling like a rubber clashes against the skin. However, it is insufficient sensitive to use a numbing cream. Afterwards it is necessary to use a total sun block (SPF50 SPF60/) over the treated area. • Tetracyclines (certain antibiotics). You can be hypersensitive to light. We leave about 3 till 6 weeks in between the treatments.